Numa means Touch in Gathang which is the language of the Worimi people. The Numa package is a perfect taste of both the physical and spiritual healings our practitioner Nadine has to offer. Allow yourself to get lost in relaxation and spend some time out just for you. Reiki is a safe, natural and gentle form of energy healing . Reiki not only aids in helping the physical body but also your emotions. A reiki healing session can assist you to start to release that ‘stuff’ you may be carrying around such as past hurt, grief and anger. Reiki treats the whole person including body, emotions, mind and spirit creating many beneficial effects such as relaxation, feelings of peace, security and wellbeing. You do not have to be ill to reap the benefits of a Reiki healing session. Our Reiki practitioner Nadine Russell is a Reiki Master and Angel Intuitive. During a healing session she works closely with her Ancestors, the Angels and Archangels to help you physically, mentally, emotionally and spiritually during every healing session. The AromaTouch Technique improves wellbeing by reducing physical and emotional stressors and supports healthy autonomic function. The technique uses doTERRA’s certified pure therapeutic grade essential oils for an unparalleled grounding experience for recipients. Unlike traditional aromatherapy massage, the AromaTouch massage technique utilises 8 specific essential oils and blends to promote relaxation and stress relief, offers immune support, decreases pain and inflammation and elevates mood. The essential oils are applied along energy meridians and on reflexology points to stimulate and promote homeostasis and bring balance in the body. During a session the practitioner applies a series of oils and oil blends with a carrier oil to the back and feet using different hand techniques. The oils and oil blends used are dōTERRA Balance®, Lavender, Tea Tree, dōTERRA On Guard®, AromaTouch®, Deep Blue®, Wild Orange, and Peppermint. Balance and Lavender are used for stress management. Tea Tree and On Guard for Immune Support. AromaTouch and Deep Blue for Inflammation and Wild Orange and Peppermint to bring balance to both body and mind. Our practitioner Nadine Russell is a doTERRA wellness advocate and AromaTouch certified. All essential oils applications are done using Coconut or Sweet Almond carrier oil. Please notify at time of booking if you are allergic to any materials mentioned above. The Numa package is only available with our practitioner Nadine. All packages must be paid in full at time of booking. 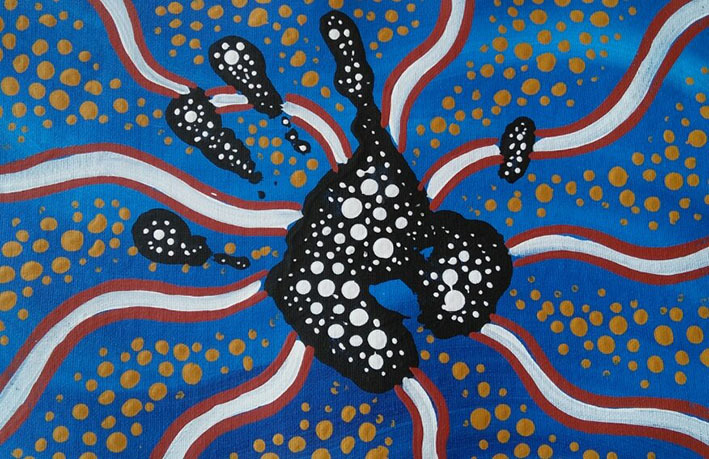 Artwork by Aboriginal Artist & Worimi man Jason Russell.